Words and photos by Rob Whelan. 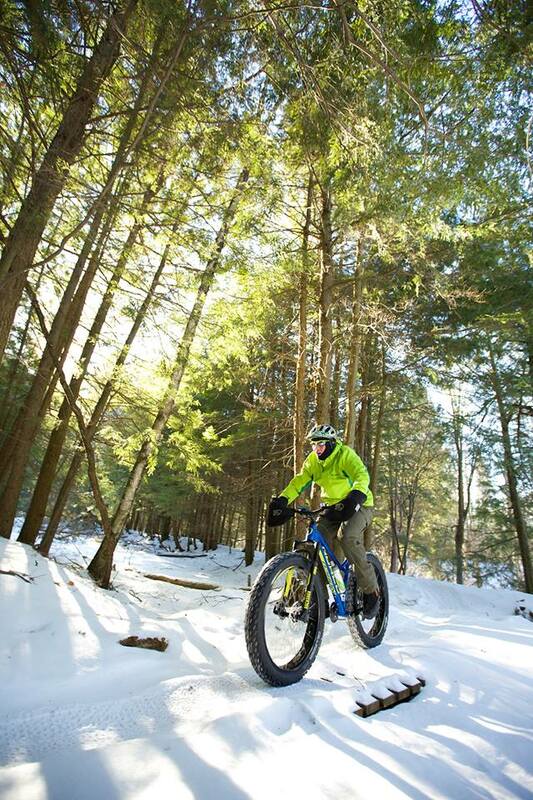 It’s not what it sounds like, but there are fat bikes and guns. 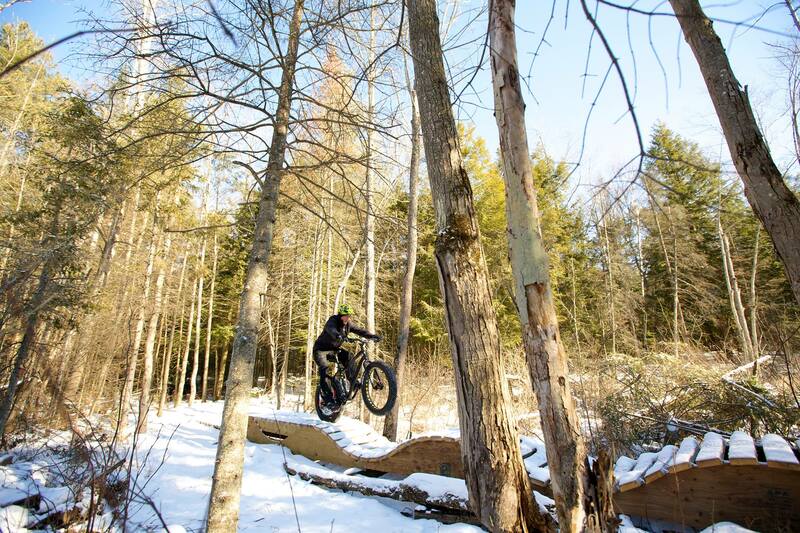 The community of zany riders at the MTB Kingston trails is up to something a little outside the box, even for fat bike riders. As if riding bikes in sub-zero temperatures on snowy trails wasn’t niche enough, the mastermind of MTBK and director of trail development came up with another excuse to get a group of riders out on the snow every Sunday morning. The Fat Bikeathlon! From rear racks with chainsaw mounts to pogies to gnarly homemade studded tires, fat bikes see a lot of not-so-subtle tweaks. 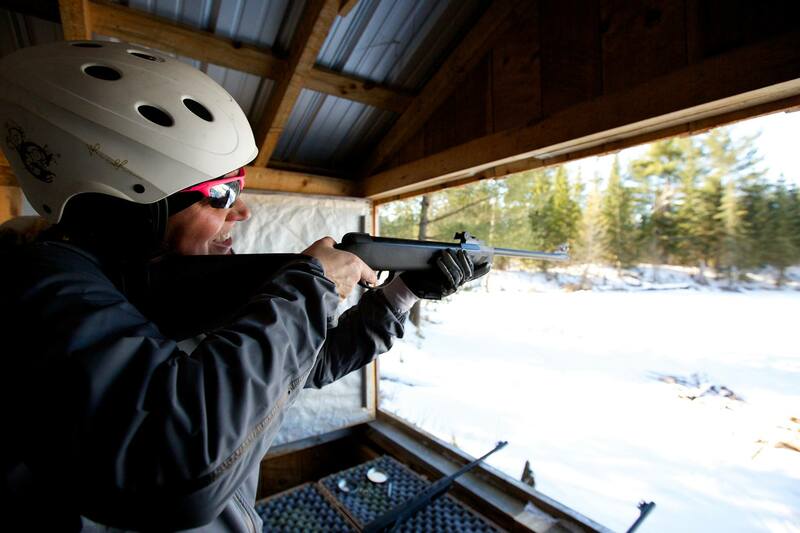 While loosely based on the Olympic Biathlon, the idea for the Fat Bikeathlon was born out of one of these utilitarian upgrades, a picture seen online of a fat bike’s shotgun rack during hunting season. Not kidding! Fueled with inspiration and an idea, a new “sport” came to be. Question: if we get a bunch of pellet guns, would you be interested in doing a biathlon series? Answer: OK, but I’ve never fired a gun! Retort: That makes 2 of us. OK, so now we’re a bunch of riders with no shooting experience and a pretty sketchy idea. Luckily a fellow club rider at our humble, not-for-profit bike club has actual experience in biathlon so he came in and gave a session on gun safety, loading, firing etc. Perfect, now we’re all pro. Using the warming hut about 25 minutes into the trail as the shooting station (where the guns stay put) and starting point, a 1km loop was carved out of the snowy woods with a 200m penalty loop for missed shots. The format puts riders out for 5 laps, 1 shot at the dangling frying-pan target at the end of each lap, best time wins. The term “win” is used loosely since there are no prizes other than bragging rights. The course and the format are designed to separate the pack and have a different winner every week, balancing riding skills with shooting accuracy. Really though, it’s all about getting out for a ride, having fun and fostering a great community of riders through the winter months. We’re all pretty stoked for Sunday morning to roll around again!